Family Dysfunction and Mental Health Blog: Does One Need to Forgive Abusive Parents in Order to Heal? The reality is that it can in fact cause some who heed this advice, further harm...Your advise followed would not always lead to healing. Your certainty disturbs me---this column does not even mention the possible NEGATIVE impact of if FAILING. All treatments have the potential to help, and the potential for harm. In my experience, I have rarely been informed of potential "negatives" in ANY recommended treatments proposed by a psychiatrist or other mental health professional---this is not ethical or responsible. You are absolutely correct. Doing this poorly is far worse than not doing it at all, and doing it well is never easy. I put the caveat in my "how to disarm a borderline" series of posts that in most cases it should not be done without the help of a therapist. The same can be said about metacommunicating with abusive relatives. I'm sorry I did not add that in this post, but I was focussing on the forgiveness issue. In therapy, I always prepare patients for the worst responses, and plan with them what to do if and when they get them. Fortunately, patients are very good at predicting exactly how family members are going to react to various strategies. After all, they've lived with them all their lives. I use "role reversal" to see what they are up against. They play the targeted relative and I try out various approaches to see which ones have the best chances of success. The patient and I also extensively explore the parents' backgrounds using genograms, so I generally have a pretty good idea about why the parents react the way they do. After we find a workable strategy, I switch roles with the patient and the patient practices the strategy we decided on with me playing the parent. When I play the targeted parents, I play them as worst case scenarious - as bad as the parents are likely to act - to prepare the patient for the worst. Luckily they seldom get it if we work out the strategy well, but sometimes they do. If that happens, I tell the patient to back away immediately and say something to the parent to the effect of "Let me think about this and get back to you." The patient is told to write down the conversation as close to verbatim as possible and bring it back to me. We then figure out what went wrong and revise the strategy. This requires persistance, but where there's a will there's a way. And medication CAN help patients to stay calmer during the whole process. I my self forgave only in my mind. Not in person. And this gave me profound peace. I am on a path of self healing. As there is no hope in the area I live in for more than a per scripting Dr. I am on lexapro and it has been very helpful. But I find it addictive. I have tried to stop only to find I can not function. Or even walk strait. I went to a medical Dr and he said that I need help to get off the script. He gave me sea sick pills and said to get back on the meds. It took me along time to be OK again. But I work on it every day. Ptsd was my orriginal problem, then another Dr said sever depression. When in reality it was my life changed in drastic ways. That I could no longer deal with by my self. Somehow surviving an abusive childhood seemed like a miracle in itself, however as the past five years have progressed I have tolerated a distant relationship with the family members responsible. 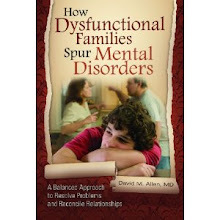 Would your recommendation for healing that family unit change if those same family members response continued to be denial or even blaming myself for their past or current bad actions? In a recent conversation with them, I was ridiculed for not allowing them to visit my home because it would involve them sleeping over. "You are lucky we even talk to you.."
What you are describing is, in fact, the typical response people from an abusive family get as adults. There are ways to get past the family's denial and blaming (which I blog about in other posts), but it is not easy and usually requires the assistance of a therapist in order to implement successfully. If you are just going to get blamed, it's better to keep contact to a minimum for the time being. If you look for a therapist, look for one who specializes in what I'm talking about. And not one that thinks you should divorce your family. I have recently moved out of home due to abuse by both my mother and father. But since moving out, I have been harassed and borderline stalked by my father who refuses to listen to me when I tell him I'm uncomfortable. I have attempted to be reasonable with him and forgive him, but I find it very difficult to maintain my forgiveness front when my father continually reminds me that I don't have any basic rights of dignity and respect. How can I forgive and forget when my family refuses to assume responsibility for their behaviour and instead turns it back on me and then further harasses me and stalks me when I try to limit contact? It was the point of this post that forgiving parents is generally not possible under the circumstances you describe. No one can really forgive someone else if that someone continues to hurt them on an ongoing basis. And if your parents are continuing to treat you this way as you describe, that tells me that it is very likely that they feel like they do not deserve your forgiveness and are more comfortable with your hate, although deep down they yearn to be forgiven. And there may be some things that you do with them that feed into the problem. 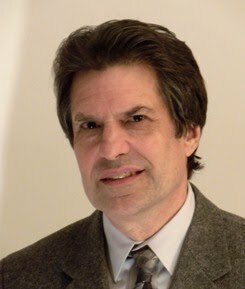 In order to devise and plan a strategy for getting through your family's formidable defenses, and getting them to stop their invasive and invalidating behavior without completely cutting them off, you would most likely require the assistance of a therapist who is well versed in this process and in family system dynamics, such as a Bowen systems therapist or a Schema therapist. Such therapists are very difficult to find but are worth searching for. Many therapists would just tell you to divorce your family, but I don't think that is the best possible outcome(although getting a restraining order and doing whatever it takes to enforce it might be better in many cases than continuing to be abused - if one is unable or unwilling to optain the help one needs. My husband's stepfather was abusive. I have heard my husband on several occasions lament this fact and that he didn't enjoy his childhood and regretted not having a decent father figure. His mother is still with this man, and they have since helped raise their daughter's child and have had a loving relationship with him - and he has since mellowed and I've not seen a sign of violence. However there is a history of sexual abuse among some of his family members (his brother and son were sexual abusers), though my husband says he never saw anything like that growing up. My husband's mother now keeps asking for overnights and extended alone visits with our 6 month old daughter. I feel if there is a 1% chance of anything happening I don't even want to leave her with them at all. But we have left her for a few hours a couple of times, and I feel that is the most I can give. I feel I am hurting my husband, because it hurts him that I don't trust them and there is pressure on us because they want time with her. And I can't help but blame his mother for not protecting him as a child. Can an abuser change? In this scenario, do you think there could be potential for sexual abuse even though my husband says he never saw anything as he ws growing up (he had two step siblings)? Am I overreacting by not accepting that people can change? Certainly people can and do change and mellow out as they get older, but if your husband's stepfather was physically abusive in the past, I would NEVER recommend leaving a child with him and your husband's mother without one of you being present. Better safe than sorry. If his mother and step-father can't seem to understand why you would take that position, then they have probably not come to terms with what they did to your husband in the past. (I can't really answer about the potential for sexual abuse without knowing a lot more about that family). I assume that your husband has not had a long and illuminating discussion with his mother & stepfather about the past abuse. As I describe in the post, doing so is important for all concerned but might require the assistance of a therapist in order to avoid the many potential pitfalls involved in this sort of endeavor. My father abuses me, and has for my entire life. Lately I've been spending less and less time with him because we fight if I'm around him. I sometimes feel ready to forgive him, but other times I still feel resent toward him. Is this a normal reaction? What should I do? Certainly you are describing a very normal reaction to an ongoing problem with a parent. As I said in one of my earlier answers to another comment: No one can really forgive someone else if that someone continues to hurt them on an ongoing basis. In order to plan a strategy for getting through a family's formidable defenses (including perhaps one's own), and getting them to stop their negative behavior without completely cutting them off, most people would most likely require the assistance of a therapist who is well versed in this process and in family system dynamics, such as a Bowen systems therapist, a Schema therapist, or someone versed in Interpersonal Reconstructive Therapy. Such therapists are very difficult to find but are worth searching for. I am the person with the baby and the in-law who mistreated my spouse as a child. We finally all had a sit down. It went as well as it could. My Mother in law is still in denial and can't understand why I am hesitant to trust her/them with my child and have rules and restrictions for them. My husband was able to express feelings a longtime coming. The stepfather (the abuser) was pretty much accepting of the whole thing and didn't argue. My mother in law is seeing a psychiatrist and I offered to go with her and she claims her psychiatrist doesn't do "family counseling." I can't help but think she just doesn't want the possibility of my point of view supported by someone objective. But I think the talk helped - moreso that acting like everything is a-ok.
Nice to hear that everything was brought out. Congrats to you and your husband! The responses you received could have been a whole lot worse that the type of denial you describe. You may just have to give your mother-in-law some time to adjust. It is quite possible that she covertly feels really guilty about what happened, and is in effect giving your husband an excuse to punish her - specifically, an excuse to be angry at her for not being willing to own up to what happened. Sounds weird, I know, but I see it all the time in my practice. I've tried multiple times to forgive my mom and stepdad and try to get them to come to counseling with me, but it is pointless. They will never accept that they did anything wrong. Everytime, I try to explain how their past and present behavior hurts and affects me; they agree with everything I have to say. Then, I find out later from someone else that I blamed them for everything wrong in my life and chewed their a**es out. The best story was my stepdad telling everyone that I blamed him for ruining my life and somehow I forced him to pay for my meal. Anytime, I have talked with my stepdad he always pays for my meals despite my protests. When I bring up the subject of counseling, I get told that I am the only one who is crazy and needs to go to counseling. They will not even consider going to counseling with me, because they are too embarassed or afraid that someone will tell them the truth. I have been told for years that my memory was wrong or that I didn't remember things right, but now I see why. The best part is that they act like nothing is wrong. I don't talk to them for over a year and then my stepdad shows up at my job a few days before my birthday telling me, "Well we thought you wanted to hang out with us, so why don't you come over for your birthday?" Are you crazy!? I haven't talked to you for over a year and you believe that I am wallowing or unhappy because I am no longer around you? I swear my parents are completely insane; hence why I have no further contact with them. No matter what I say or do, it is either I put up with their insanity or I choose no longer to be around it. The worse part is the way the rest of the family treats me. My parents have turned everyone against me. They accuse me of spreading lies and stories about them behind their backs (which I never do because nobody in my family wants to speak to me). Everytime, I try to contact my family there is this hesistancy and lack of questioning. They never ask anything about my family and their behavior is between treating me like a stranger or a dangerous criminal. It is very, very frustrating and upsetting at times, because I feel like I am so alone. Everyone else around me has family to fall back on in case of bad things happening. If anything should happen to me, I am completely and utterly alone. My parents have already told me that I better be prepared to live in a cardboard box before I ever consider coming back to live with them. Even after I told them how terrible that makes me feel, they have never denied it. Even better, when I told them how they make me feel like a failure and believe that they see me the same way, they have never denied either assertion. No, I want nothing more to do with my family. Despite its drawbacks, loneliness and solitude are much preferable over being around a bunch of people who absolutely despise me and treat me like a piece of trash. If they refuse to change their ways, leave them be and move as far away as you can. If you have other family (in my case, my dad's side), then start a new family. Not that it's any consolation, but there are a lot of families who act in ways very similar to the way you describe. Trying to break through all of their denial and counterattacks is no easy task, as you have found. It is better to stay away than to be mistreated, but those might not be the only two options. Since trying to reconcile with them on your own has not been successful, have you considered trying to find a therapist who is familiar with these family tactics and knows how to help you counter them? Most therapists don't know these techniques, but there are a few around and they are worth looking for. Greetings. My name is Omar. Congratulations, Dr. Allen for you blog, and thanks to all the participants for their contributions: they have been very nutritious. A week ago I started Googling "borderline patients with no family support", and I found this blog, and today in particular, I identify in great way with the history of Anonymous May 16, 2012 at 11:10 PM. First, let me tell you that I am a Colombian, 28 years old guy (sorry because of my English). I have a brother and a sister. Both older than me. I grew up in a middle-class home. My parents gave me all the material stuff: food, clothing, school, etc. I was not physically maltreated (not exaggeratedly), but my opinion was never taken into account. I was not sexually abused by my father or anyone else. But all my childhood I suffered the bullying of my brother. My parents never defended me or made me respect from him. My mother always told us that "all children should be treated the same". Since I have memory, my parents usually ignored me whenever it was something very important to me. When my brother was 20 years old, he fell into drugs, but my parents supported him in his two years of treatment. Now he is an independent business man, and my sister is a succesful physician (they both don’t support me and only say the only thing I wanna is drawing everybody’s attention). Meanwhile, when I was 18, I began to have emotional problems. Since then, and during the last 10 years, I have visited more than 5 psychiatrists and more than 6 psychologists and I have been given different diagnoses (depression, bipolar disorder, obsessive compulsive disorder, schizoid paranoia). The first year of treatment I was by myself. Then I decided to tell my parents about my psychiatric problems (and I regret tremendously). At first, the only help they gave me was just money for medical appointments and medication. In the best of circumstances, I was accompanied by them to other cities in order to attend psychotherapies. It was all they did. Over time, the therapists were trying to involve my parents a bit more in my treatment. However, apparently they decided to "wash their hands" with the excuse that I was an adult man who had to take care of my own life, and have always kept out of the subject. Two years ago, I was diagnosed as a patient with BPD. Although I am professional, with a postgraduate degree, I have worked in several universities and cancer centers, and that I have lived away from them by my own several times since I was 16, I have not been able to keep any job, I have no friends, and the only person which I count on is my girlfriend (I’m living with her because oll fo this), who by the way is already beginning to feel the ravages of this disease. Nowadays, my life isa ll a chaos, I do not know who I am, what I want or what to do with my life. I’m almost mute. Ideas of death are been growing recently. I have talked about it with my parents on several occasions, sometimes on my own, sometimes in front of various psychologists, psychiatrists, friends, church ministers, etc. And their attitude remains the same: to act as if nothing happened...to ignore me all the time (it is as if they cared more about the animals of their farm than the welfare of their own son). I recently told them how that made me feel. And I asked them if they were not interested in my treatment, or in my improvement, they had better stay away from me. Even so, they keep insisting on visiting me by surprise, and they insist on inviting me to their house, and every time they are with me, they continue to act in exactly the same way! Even though they have committed to therapists to support me. Is it still wrong in this case to think I have to run away from my parents? I would like, Dr. Allen, to give me your appreciation of what that means. What am I doing wrong? Thank you so much. Unfortunately, I can't give you any good psychiatric advice about how to handle your parents without seeing you in therapy and getting a lot more detail than can possibly be provided in this venue, and without working with you to construct a genogram that might explain why they act the way they do. In general, families that create BPD do the kind of push-you-away and then pull-you-back-in that you seem to be describing. Not a lot of therapists are familiar with the family dynamics of BPD, and I have no idea what's available in Columbia, but I would advise you to keep trying to find one who does. Doctor, if extremely controlling, manipulative and abusive parents refuse to acknowledge they ever did anything wrong, just hang up when you mention domestic violence etc.......what then? I had a 12 year break from seeing my violent father - what happens? 12 years later he threatened me with another beating, but this time I faced him down. And was left with PTSD symptoms as a result. If abusers never change - and we know violent domestic abusers - no, they don't change, then putting onesself in physical danger can never be right. I know you're not advocating this. But extremely controlling and abusive people, they're not going to change, or even admit in most cases there's anything wrong about their behaviour. I moved continents to get away from my family, as did both my aunts, and truth be told I would even feel safe living in the same country. I feel safer, happier, and healthier for cutting them completely from my life. How can ever having any kind of relationship with people who have only ever done one harm be fruitful or positive for the abusee? As long as such a relationship remains the same as it was, it can never be fruitful to have one. Believe it or not, however, there are ways to get abusive parents to quit lying (that's what"denial" is, and they know it) to you and pushing you away (although they may keep doing it to others). Even if they hang up on you at first. 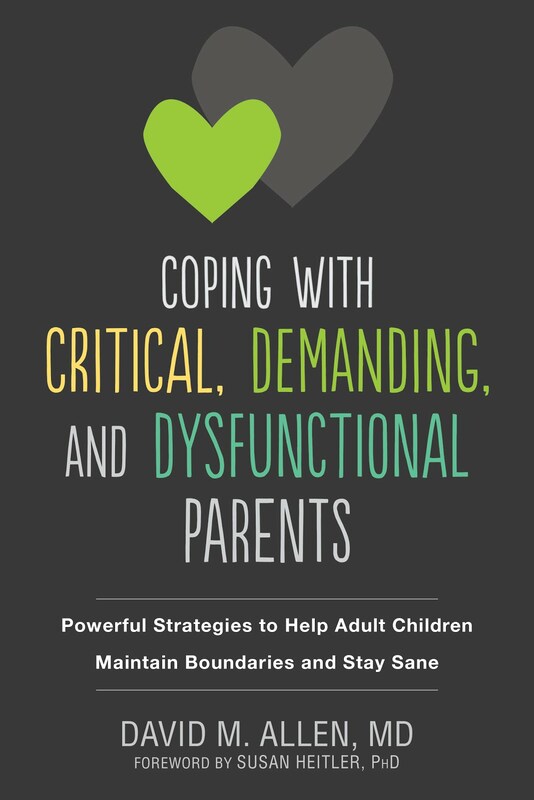 These ways are anything but easy or obvious and different for every family, and therefore require the help of a therapist who knows how to deal with families like the one you describe. Of course, there are no guarantees. If ongoing violence is an serious issue, these interventions should be done over the phone and not in person. In the absense of a change of behavior from an abusive parent, or the inability of an abused person to find the right help, cutting them off is the next best alternative. In no situation do I recommend continuing to take abuse from anyone. There are sadistic,narcissistic and antisocial people with whom many approaches that usually might work just won't. Also there are dissociative conditions where asking for better treatment from ones family of origin is a completely different situation... You know a father who keeps sexually abusing his adult child and the child not even remembering it happening. Would you say that the techniques you recommend truly work with patients and/or relatives that have severe much worse than BPD pathology? Thanks for your thoughtful question. I've seen the techniques work surprisingly well with some extreme situations, but of course the more extreme, the worse the prognosis. There are no guarantees. If sexual abuse were still happening with an adult who was dissociating every time (I've never seen that in 40 years), the odds that such a person would even be coming for psychotherapy are pretty remote.